If you’re going to be decking your roof out with solar tiles, there’s a possibility that you may forgo what might be the best placement of a skylight in favor of more solar cell square footage. 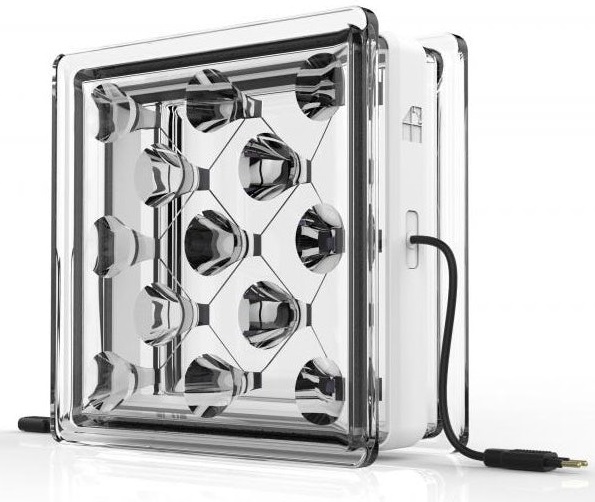 Luckily solar glass is fast becoming an option, and these clever glass blocks are the best option I’ve seen yet. Other solar glass options generally harvest in the infrared range, since if you captured the full spectrum — well, that wouldn’t be a window, it’d be a wall. But the energy you can capture is limited. Researchers at the University of Exeter thought up an interesting alternative that may be the best of both worlds (until the next breakthrough, anyway). They created these thick blocks of glass with optical features — not quite lenses or tunnels, but sort of light guides — that funnel light from a large area on the sunny side of the window onto a much smaller cell on the inside. By concentrating the light onto a smaller point, you get considerably more energy out of the cell’s tiny surface area than if it were ordinarily illuminated. It won’t be as much as a full-on cell covering that amount of space, but at least it’s transparent! Apart from the little cells and the wires connecting them, of course, which actually make a rather cool-looking pattern. And because of their thickness, these Solar Squared units, as they’re called, even provide decent insulation. Free light, free power, and free thermal insulation — or free after it pays for itself, anyway. That could make it attractive to larger building designers, who are always looking to integrate energy-saving, green features like this into their work. Solar Squared is being spun off from the University as an independent business endeavor — a company called Build Solar. Of course you can’t order these things right now — it’s still a prototype and they’re waiting on the patent to go through. But it’s a smart idea and one that seems likely to find its footing in the commercial world. If it sounds like a good match for something you’re building — and you’re in the UK somewhere convenient to Exeter — contact the team and maybe you can work together to put together a demo roof.